If you wish to cancel your place, you must inform us by email or letter. fees paid or the deposit, whichever is the greater, will be refunded. • Notice of cancellation received 29 days or more prior to course date, all fees paid will be refunded. 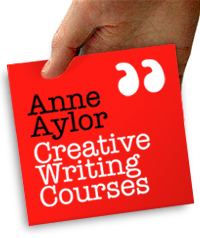 Anne Aylor Creative Writing Courses reserve the right to appoint an alternative tutor should illness or any other emergency prevent Anne from teaching. Creative Writing Courses also reserves the right to cancel a course if exceptionally low enrolment would make the course unviable. If a course is cancelled, all those enrolled will be notified and a full refund of any fees paid will be made.